Vanadium dioxide nanobeams synthesized by Berkeley researchers show exotic electrical and thermal properties. 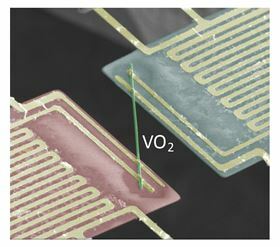 In this false-color scanning electron microscopy image, thermal conductivity was measured by transporting heat from the suspended heat source pad (red) to the sensing pad (blue) via the vanadium dioxide nanobeam. Image: Junqiao Wu/Berkeley Lab. There's a known rule-breaker among materials, and a new discovery by an international team of scientists adds more evidence to back up this metal's nonconformist reputation. According to a new study led by scientists at the US Department of Energy's Lawrence Berkeley National Laboratory (Berkeley Lab) and at the University of California, Berkeley, electrons in vanadium dioxide can conduct electricity without conducting heat. This finding, reported in a paper in Science, could lead to a wide range of applications, such as thermoelectric systems that convert waste heat from engines and appliances into electricity. For most metals, the relationship between electrical and thermal conductivity is governed by the Wiedemann-Franz Law. Simply put, the law states that good conductors of electricity are also good conductors of heat. But it turns out this is not the case for metallic vanadium dioxide, a material already noted for its unusual ability to switch from an insulator to a metal when it reaches a balmy 67°C (152°F). "This was a totally unexpected finding," said study principal investigator Junqiao Wu, a physicist at Berkeley Lab's Materials Sciences Division and a UC Berkeley professor of materials science and engineering. "It shows a drastic breakdown of a textbook law that has been known to be robust for conventional conductors. This discovery is of fundamental importance for understanding the basic electronic behavior of novel conductors." In the course of studying vanadium dioxide's properties, Wu and his research team partnered with Olivier Delaire at DOE's Oak Ridge National Laboratory and an associate professor at Duke University. Using results from simulations and X-ray scattering experiments, the researchers were able to tease out the proportion of thermal conductivity attributable to the vibration of the material's crystal lattice, represented as quasiparticles known as phonons, and to the movement of electrons. To their surprise, they found that the thermal conductivity attributed to the electrons is ten times smaller than would be expected from the Wiedemann-Franz Law. "The electrons were moving in unison with each other, much like a fluid, instead of as individual particles like in normal metals," explained Wu. "For electrons, heat is a random motion. Normal metals transport heat efficiently because there are so many different possible microscopic configurations that the individual electrons can jump between. In contrast, the coordinated, marching-band-like motion of electrons in vanadium dioxide is detrimental to heat transfer as there are fewer configurations available for the electrons to hop randomly between." Notably, the amount of electricity and heat that vanadium dioxide can conduct is tunable by mixing it with other materials. When the researchers doped single crystal vanadium dioxide samples with the metal tungsten, they lowered the phase transition temperature at which vanadium dioxide becomes metallic. At the same time, the electrons in the metallic phase became better heat conductors. This allowed the researchers to control the amount of heat that vanadium dioxide can dissipate by switching its phase from insulator to metal and vice versa at tunable temperatures. Such materials could be used to help scavenge or dissipate the heat in engines, or be developed into a window coating that improves the efficient use of energy in buildings, the researchers said. "This material could be used to help stabilize temperature," said study co-lead author Fan Yang, a postdoctoral researcher at Berkeley Lab's Molecular Foundry, a DOE Office of Science User Facility where some of the research was done. "By tuning its thermal conductivity, the material can efficiently and automatically dissipate heat in the hot summer because it will have high thermal conductivity, but prevent heat loss in the cold winter because of its low thermal conductivity at lower temperatures." Vanadium dioxide has the added benefit of being transparent below about 30°C (86°F), while absorbing infrared light above 60°C (140°F). Yang noted that there are more questions that need to be answered before vanadium dioxide can be commercialized, but said that this study highlights the potential of a material with "exotic electrical and thermal properties". While there are a handful of other materials besides vanadium dioxide that can conduct electricity better than heat, this property only occurs at temperatures hundreds of degrees below zero, making it challenging to develop into real-world applications, the scientists said. Using nanowires of a molybdenum-germanium alloy, scientists have been able to explore the transition from a superconducting to a normal metal state. Novel diffusion mechanism in the presence of excited electrons?